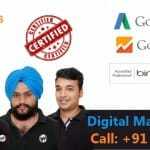 SEO Company in Mohali – Are you still looking for best SEO company in Mohali, Chandigarh? If yes then you are at right place. WebHopers is the best digital marketing company who is known for providing result-oriented white hat & best SEO services in Mohali for all businesses. We have a team of talented and experienced search engine optimization experts who have 6+ years of experience in running startup businesses from scratch. This is the reason that we are listed #1 on the list of top 10 SEO companies in Mohali. SEO is the best way on which you can generate free business online for the long term. So if you want to get your business website ranked on top competitive and high traffic business keywords. Then call WebHopers now at +91 7696228822 or you can also contact our SEO expert Mohali on Skype at WEBHOPERS. 100% results guaranteed by using only White hat search engine optimization techniques. Mohali is also a popular city which is situated near Chandigarh. There are several top companies related to several businesses like acting schools, Real estate, pharma companies are present at theirs. So it is clear that all those companies need marketing in order to sell their products or services. But when it comes to the modern marketing methods. Online marketing becomes one of the most important aspects of any business. No need to pay for click like in PPC. You can get long-term business results. You can also increase the online awareness of your business. Also, improve your brand visibility by maintaining top rankings for a longer duration of time. Search engine optimization also helps in getting more potential customers from search engines and also helps in increasing brand reputation. ON Page Search engine optimization services Mohali. OFF Page search engine optimization Services Mohali. Our ON page optimization services include website structure optimization according to the search engine policies. Which includes heading tags optimization, images alt text optimization, meta tags optimization, content creation, implementation of the content strategy, rich content creation and implementation etc. Our OFF Page search engine optimization Services for businesses of Mohali includes social media optimization. In which social media is done. Luxury link building is done in order to get weight age with social bookmarking etc. But after the update of google algorithms OFF page search engine optimization is less preferred by our search engine experts Mohali. Why Choose WebHopers as your Best SEO Company in Mohali? We have a team of search engine specialists who provide you best services. Work with only 100% white hat search engine optimization techniques. Known for providing best luxury link building services. We have Team of Google and Bing certified professionals. Most of the people think that implementing search engine optimization technique is a very easy task. Most business People think that they just have to add meta tags and afterward, only OFF page optimization is needed. But this is not true. In 2016 providing search engine optimization services or implementing search engine optimization techniques has changed a lot. You have to keep the user in mind rather than search engines. WebHopers has the right to say them as best search engine optimization company for the business of Mohali. Our work process which makes us best in the industry is as mentioned below. We are a team of startup guys. So the work culture is also fully startups. We work according to the strategies and search engine algorithms. Without knowing your business completely we do not implement any search engine optimization techniques. With the help of implementing search engine optimization. You can increase your business reach any location. So if you want to get best SEO services at Mohali and want to get customers from search engines. Then feel free to contact us. There are several businesses and agencies of Mohali engaged with our SEO services Mohali. Just try WebHopers SEO company in Mohali once and we assure you that you see the business growth from the first month. Pay only for results.